Watch Weezer Cover Tears For Fears Live On Jimmy Kimmel - Kerrang! James Thomas "Jimmy" Fallon is an American comedian, television host, actor, singer, writer, and producer. He is known for his work in television as a cast member on Saturday Night Live and as the host of late-night talk show The Tonight Show Starring Jimmy Fallon. He was born in Bay Ridge, Brooklyn and raised in Saugerties, New York. He grew up with an interest in comedy and music, moving to Los Angeles at 21 to pursue stand-up opportunities. Bay Ridge, Brooklyn, New York City, New York, U.S. He was commissioned to join NBC's Saturday Night Live as a cast member in 1998, fulfilling a lifelong dream. Fallon remained on SNL for six years between 1998 and 2004, co-hosting the program's Weekend Update segment and becoming a celebrity in the process. He left the program for the film industry, starring in films such as Taxi (2004) and Fever Pitch (2005). 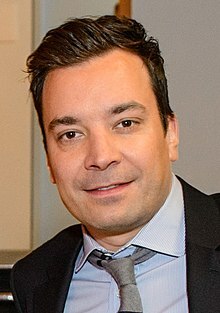 Following his film career, Fallon returned to television as the host of Late Night with Jimmy Fallon on NBC in 2009, where he became well known for his emphasis on music and games. He moved from that program to become the sixth permanent host of the long-running The Tonight Show in 2014. In addition to his television work, Fallon has released two comedy albums and three books.